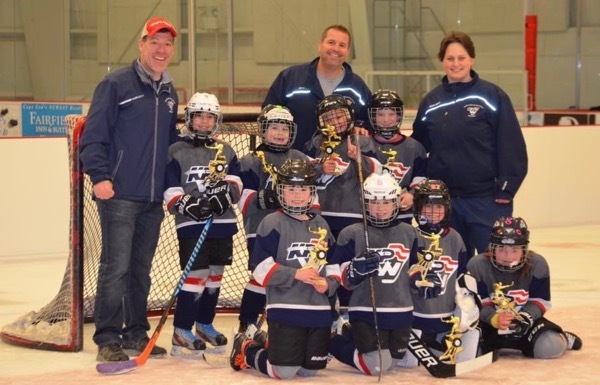 Registration now is open for all players interested in participating on King Philip Walpole Youth Hockey teams during the 2019-20 season, the program's 50th anniversary. KPW is excited to announce plans for the 2019-20 season, which will feature a continued focus on skills development through partnerships with Pro Ambitions, Stop-It Goaltending and Goaltending Development Services; preseason boot camps for all full-season teams; and league membership at levels appropriate for all of our teams — all while again maintaining tuition at the same costs as 2018-19. All players must register by April 1, 2019, and submit the initial tuition payment to be considered for a team, and all players who register will be placed on a team. Players interested in the 8U Development Program, Instructional Program or Girls In-House Program can register now as well. Players on full-season boys and girls travel teams at the 8U, 10U, 12U and 14U levels will receive more than 75 hours of on-ice training and play approximately 30 games over the course of the regular season. Short-season 18U teams will play approximately 12 games, with two practices per week, to prepare players for the start of the high school season. 8U Development Progam players will practice twice and play one half-ice game a week in KPW's in-house league, with 20-22 games over the course of the season. Skater skills: All full-season travel teams will have 10-12 small-group skills sessions throughout the season with Pro Ambitions. Goalie skills: Goalies on 10U, 12U, 14U and 18U teams will participate in goalie skills sessions with StopIt or GDS. KPW will continue to practice out of rinks in Foxboro, Franklin, Norfolk and Attleboro, ensuring we have enough ice for all of our hockey needs and our families can have access to a variety of local facilities. You also can find more details on 2019-20 program offerings and information on what you can expect from KPW. King Philip Walpole Youth Hockey will award $500 alumni scholarships to two seniors graduating in 2019 with a history of participation in the program. The scholarship selection committee is seeking student-athletes who will attend college or trade school in Fall 2019 and have demonstrated a significant commitment to the KPW program, their community and their academics. More information is available on the KPW Web site, and completed applications must be submitted by April 30. King Philip Walpole Youth Hockey again will partner with local professional ice skating coaches to offer a summer skating skills series to focus on the fundamentals of the proper stride, including posture, balance, stability, rhythm and strength, which translate to better power and speed. Already a strong skater? These series will fine-tune your stride to make sure it is as efficient as possible. The skating skills series are open only to current KPW players. Due to strong demand over the previous years and feedback to limit the number of skaters working with each coach, KPW expanded the program to offer two sessions per night in two eight-week series, and will limit each series to 14 skaters, with two coaches per session. In short: only 28 skaters can register for each eight-week series, but we will accept wait list registrations in case we can add more coaches. Each series costs $200 for eight sessions, each night will have groups skating at 7 and 8 p.m., and all classes will be held at Norfolk Arena. The summer series will be led by Joanna Zehme, who has more than a decade of experience teaching private figure skating and hockey skating skills and group learn-to-skate lessons. She and her colleagues have led the KPW skating technique classes for the last three seasons. You can register on the KPW Web site, www.kpwhockey.org, by visiting the Register Online section. During the registration process, you can select whether you prefer 7 or 8 p.m., and we will do our best to accommodate your preference, but given the number, age, skill level and family relationships of the participants, we cannot guarantee it. The King Philip Walpole Youth Hockey 18U team won the South Shore Conference full-season 18U division championship by beating Franklin, 3-0, Sunday night. KPW went 13-1-4 during the regular season, finishing as the second seed just one point behind top-seeded Franklin (14-1-3), and opened the playoffs Saturday with a 10-0 semifinal win over the Seahawks to set up the championship game. KPW never trailed in the title game and held Franklin off throughout the hotly contested game. Congratulations to our players, coaches and families! The King Philip Walpole Youth Hockey girls U8 team — the program's first all-girls team to compete in a co-ed league — finished a remarkable season by beating WHK, 7-4, to win their South Shore Conference B2 Division group championship. Playing with eight players against teams that often had nearly twice as many on their roster, the Girls U8 team began the season by going 9-1 in the Metro South Hockey League mite division before transferring to the South Shore Conference. The Girls U8 team finished its SSC schedule as the sixth seed, and opened its group playoff with an 8-5 win over Tri-county, setting up the championship bout against WHK Sunday. Congratulations to all our players, coaches and families! 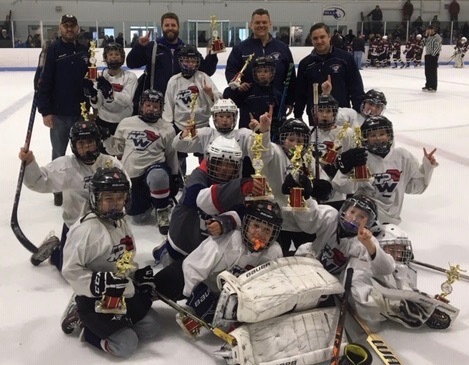 The King Philip Walpole Youth Hockey 10UB team won the South Shore Conference 10UB Re division championship by beating top-seeded Falmouth, 3-0, Saturday afternoon. KPW finished the regular season as the second see, and opened the playoffs by beating No. 7 Westwood, 7-4. They then knocked off sixth-seeded Tri-County, 4-2, in the semifinals to set up the championship game against Falmouth. The second King Philip Walpole Yuuth Hockey Putts for Pucks fundraiser golf tournament will be held at 1 p.m. Friday, May 17, at the Wentworth Country Club in Plainville. Last year's event was sold out and registration for this year's tournament will open soon, so find your partners and get ready to hit the tees.